Let me be EXTRA CLEAR. This map does NOT show a printer going to an informal scrap yard. 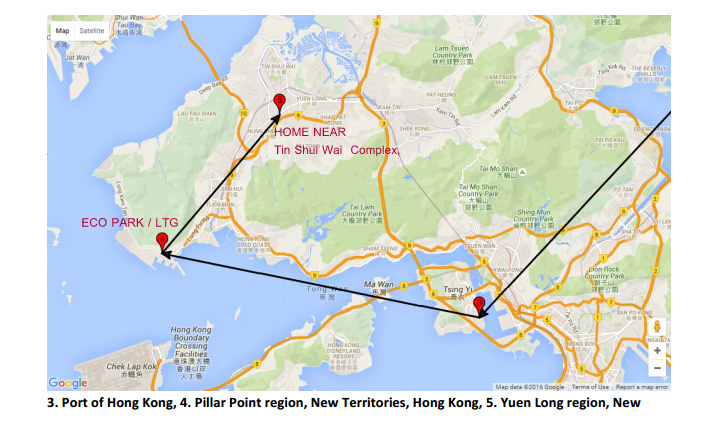 The final destination appears to be Tin Shui Wai, one of the most modern cities in the New Territories (disparaged as "cowboy land", "primitive" and "rice paddies" by the Watchdog). Again, this is not a device I knew about when I wrote to MIT in May, and it's a device from the West Coast, not one that has anything to do with Vermont or Good Point Recycling. So maybe these responses are a political (Trumpian) mistake keeps us in the negative press, maybe this blog is breathing oxygen into BAN's gills, maybe we are providing WasteDive and Recycling Today TMI on a SND (too much information on a Slow News Day), But any serious university researcher, Interpol or EPA investigator, has to know the dirty little secret behind BAN. I'm an adherant to the "Streisand Effect". "Have you stopped exporting your printer" sounds a lot like "have you stopped beating your wife"? Here is BAN's email to me finally releasing the data we requested - August 16, after the Seattle LCD to EcoPark blogs above were written. I have not provided the actual data, which Jim asked me to keep in confidence (but note his tone of "confidence" while he was writing the hatchet job against my innocent client. Jim's Board should review the blogs before and after Jim attacks innocent people like Joe Hurricane Benson, and persuade him that karma is contagious). Perhaps Jim is legitimately confused by the blogs about the released LCD data from the Seattle non-profit to EcoPark and my request for the data from MIT and BAN. Perhaps not. But to wrap this into an insinuation that I claimed a printer went to LiTong just goes to show it's the same old BAN in the business of racial profiling and character assassination. Some people think BAN's goose is cooked. I don't see how they can survive as an organization if we as environmentalists continue to expose the selective bias confirmation they are selling. They may score points for confusing reporters about R2 Certified recyclers in Hong Kong and Good Point of Vermont. But I'm always betting on scientists and data journalists and researchers to write "the rest of the story" (note Jim's "Paul Harvey" reference... not many MIT students will get that one). It is funded almost completely by E-Stewards, big shredding companies. Those companies have now cautioned the NGO not to use live Lithium batteries in its GPS trackers, as those catch fire in a shredder. What we've asked for is that GPS devices be placed in the shredded material, so that can be tracked, perhaps to modern high tech sorting facilities in Shanghai. If only intact units can be tracked through the methodology, they may either go to a modern high tech recycler like Net Peripheral or LTG, or to an informal scrap yard like Mr. Lai's Printer Farm. But how much different is Mr. Lai's Printer Farm from the metal sorters of China? How exactly is the toner BAN points to as a carcinigen managed in the process. See Atlantic Magazine's "The Metal Sorters of China". if you want to see what happens to shredded printers (photo Adam Minter). BAN is funded by big shredders (owner of one is on BAN's Board of Directors, and is a donor to PBS station that covered the story). The shredders, we maintain, are good companies, but they don't want to compete, in my experience, with big factories in China. They provided the devices BAN tracked, and perhaps (we asked MIT), provided the coordinates for MIT undergraduates to find places - like my client without a public drop off point - in Boston. As I said last summer, a contact from one E-Steward has told me confidentially how the devices were selected and tagged. So who do you suppose the funders want BAN to highlight in a 2-page attack? There are two University of Washington affiliated researchers on the Board of Directors. Did they review my personal request to Jim not to shame our client if he can't even say that my company exported anything? Can they approve of BAN sitting on our 14 page letter to MIT since May, selectively and - quite misleadingly - representing it as a claim Vermont exported to a spefic recycler in Hong Kong? The letter to Dr. Ratti was private, and did not contain any of the claims Jim Puckett created. It was an intellectual discussion about the possibilities, to explain why I wanted data that was being obscured from me. 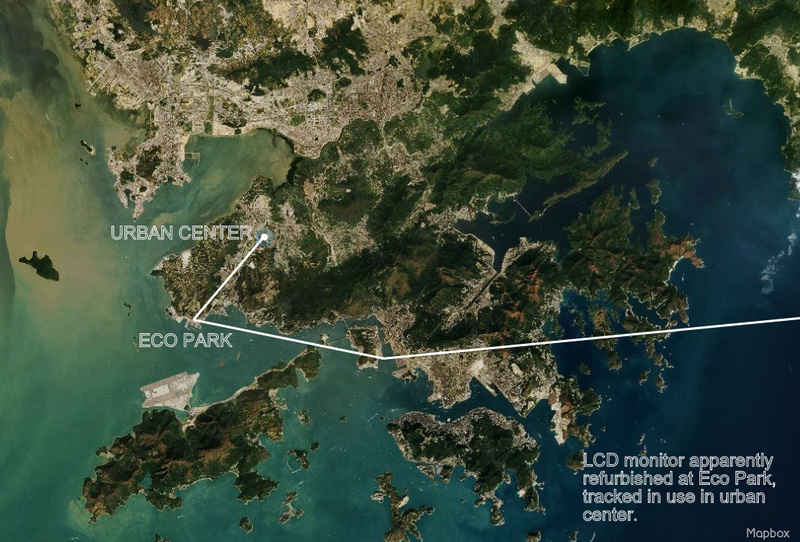 Tying a company to an obscured, obstructed site in Hong Kong and then showing dirty informal facilities - and not EcoPark - speaks of white privilege. BAN treats devices that stay in the USA as being better managed than those sent to Hong Kong, but provides only innuendo. Jim referred to Joe "Hurricane" Benson as "collateral damage". I think some reporters and board members may someday feel the heat that LTG is reacting to.